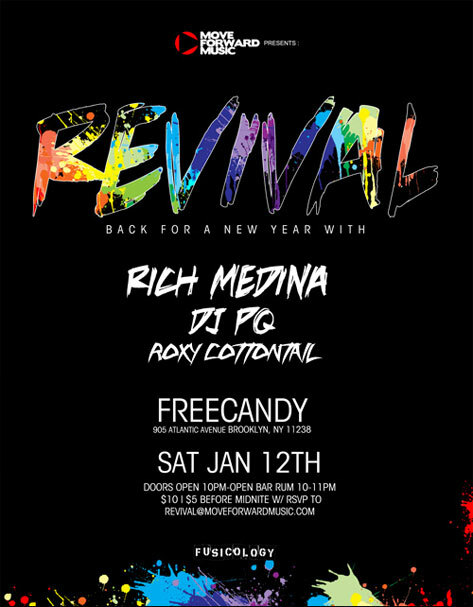 NYC Bouncers: Win Tickets To Attend The January ‘Revival’ With Rich Medina Party! Rich Medina's monthly Revival party in New York City may have taken a little Christmas break in December, but it's back in full effect for January. 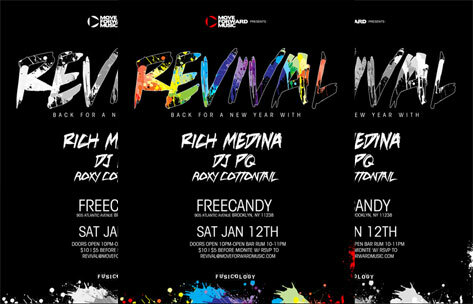 This month's Revival event is sounding like the thing to do on Saturday, January 12th with Medina on the decks at FREECANDY in Brooklyn. The colorful spot in Fort Greene will also play host to DJ PQ and Roxy Cottontail that night, and our homies at Move Forward Music have given us a pair of tickets to give away to one lucky NYC Bouncer. Hit the bounce to enter to win tickets and have your Saturday night set. 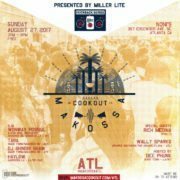 Tickets can also be reserved in advance for the bargain price of $5 by sending an RSVP email to REVIVAL[at]moveforwardmusic.com. Enter your COMPLETE NAME, EMAIL ADDRESS, MOBILE PHONE NUMBER, and ZIP CODE into the form below. Entries will only be accepted between the hours of 7 pm on Monday, 1/7 until 12 noon on Friday, 1/11. 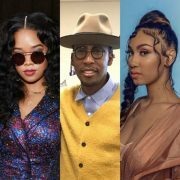 If you have won a contest/giveaway from SoulBounce in the past 30 days, you are ineligible to enter. All entries that do not adhere to the above stated guidelines will be disqualified. Entrants must be in the New York City area or vicinity and available to attend the party at Free Candy located at 905 Atlantic Avenue in Brooklyn on Saturday, 1/12 (doors open at 10 pm). One winner will be chosen at random from all eligible entrants on Friday, 1/11 to receive a pair of tickets to the party. 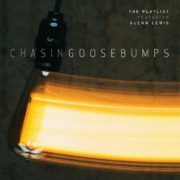 The winner will be notified by email and/or text message by Friday, 1/11 and provided with further details. The winners' names will be announced on SoulBounce's Facebook and Twitter pages. Thanks for participating and good luck! 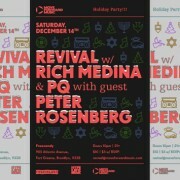 NYC Bouncers: Win Tickets To Attend The December ‘Revival’ With Rich Medina Party! 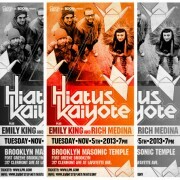 NYC Bouncers: Win Tickets To See Hiatus Kaiyote & Emily King In Concert! 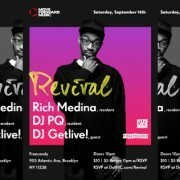 NYC Bouncers: Win Tickets To Attend The September ‘Revival’ With Rich Medina Party!